Kanu is expected to appear at the Federal High Court Abuja on October 17, 2017, to answer to the charges pending against him. Chief Okoi Urbana-Obla speaking recently said that: “The Federal Government has already filed a motion to set aside Kanu’s bail. “So it is not likely that he will appear in court on the next adjourned day for fear of being arrested by the police or security agencies. Kanu had sureties that entered into recognizance or signed bail bonds as ordered by the court that led to his release. “The court shall order his bond entered by his sureties to pay the penalty or to show sufficient cause why the penalty should not be paid. 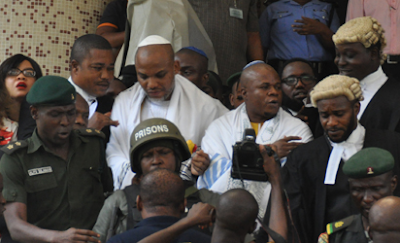 “It follows that Kanu’s three sureties will be ordered to pay N100 million each. Where sufficient cause is not shown by the sureties or the persons bound and the penalty is not paid, the court may recover the penalty from the person bound or from his estate if he is dead, in the manner laid down in the Administration of Criminal Justice Act, 2015 for the recovery of fine.